I will be doing a series of blogging tips. When I have done enough of them, I will create a page at the top of my blog and link back to all of my posts containing blogging posts so anyone who visits my blog can access them easily. Today we will be talking about how to allow your followers to subscribe to posts comments via email. I believe it is especially important to include this blogging tip because when I was trying to figure it out for myself, I couldn't find it in the blogger help centre (no big surprise there) but I was a bit surprised when no one in the google product forums knew either. I took matters into my own hands and figured it out myself. First, go to the settings tab, then click on the other tab. 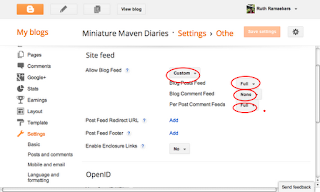 Next to Allow Blog Feed Click on Full. This will bring up a drop down menu. Change it from full to Custom. Beside Blog Comments Feed I chose none. This is because I wanted to give my followers the option of subscribing to comments regarding individual posts. If I had chosen full, they would have only had the choice of subscribing to all the comments ever made on my entire blog, and that makes no sense to me. Beside Per Post Comment Feed I chose full. This gave me exactly what I wanted. 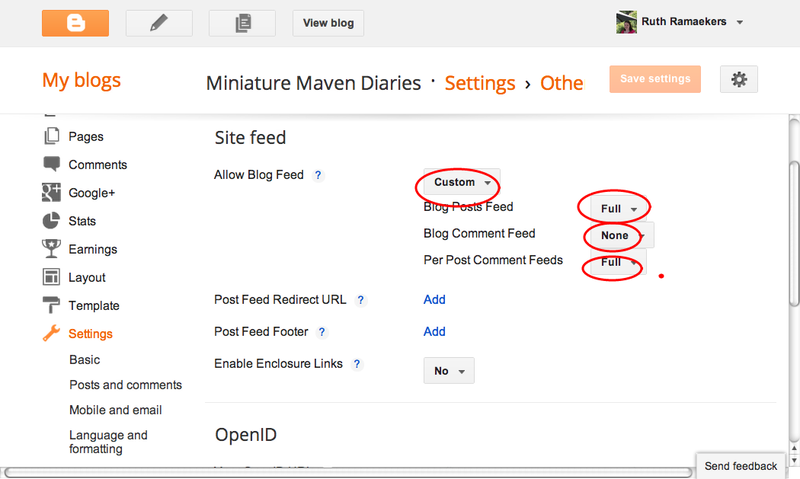 Followers now have the option to subscribe to comments on a posts per post basis. Doesn't it sounds simple? I hope the Blogger Help Centre will get around to including it in their directions some day. this was really helpful...thank you!! !